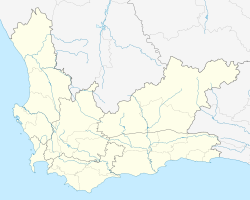 Rooi-Els (Afrikaans equivalent of red alder) is a settlement in Overberg District Municipality in the Western Cape province of South Africa. It was declared a township in June 1948, and is situated 5 km north of Pringle Bay, on the eastern shore of False Bay. It was named after the farm and river by this name. It is situated beside the Kogelberg Biosphere Reserve and is itself a registered conservancy. The town roads are narrow, un-tarred and without street lights. Klein-Hangklip mountain dominates the village, and is home to a pair of Verreaux's eagles. Other animals that may be noted are chacma baboons, rock hyrax, small antelope, African clawless otters and occasionally caracal and leopard. ^ a b c d "Main Place Rooi-Els". Census 2011. ^ a b Raper, P.E. Dictionary of Southern African Place Names. ^ a b "Accommodation in Rooi-Els". Kogelberg Biosphere Reserve. Archived from the original on 16 September 2011. Retrieved 19 October 2011. Note: Another river by this name is situated near Knysna in the southern Cape. The red alder tree does not currently occur near Rooi-Els. 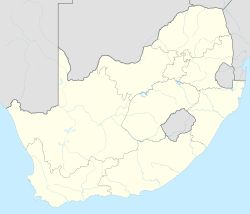 Wikivoyage has a travel guide for Rooi-els. This page was last edited on 25 March 2019, at 18:43 (UTC).